A PE & School Sport Blog without the self-promotional rubbish! Mindset – I’ve said it. Can I be popular now? Are you crap at asking questions? Revision is boring. We pretend it isn’t, but we all know it is. This activity was designed for two reasons. 1) to make revision less tedious for year 12 AS PE kids 2) so that Dave Best and I had something to talk about at the CLV festival in June. Having previously taught a “Jeremy Kyle” lesson to the AS group, it seemed like a good idea to use them as guinea pigs for another talk/gameshow session. The same “engagement” theme was apparent – I wanted to find a concept that kids would be interested in & find entertaining. The AS cohort had finished the syllabus the previous week & past papers seemed a bit tedious. Although it looks like chaos, I can imagine the TV show must require a load of spadework in order to produce the finished article. First up was the format. Our resident Northumbria University ITT student, Julie Trotter & I decided on 5 separate games/challenges that kids would complete in teams. The kids have been in the same ability groups for the last few lessons, so we left them on the same tables. Next came the tasks themselves; these are discussed in more detail below. Topics & content next, followed by HOW kids would show their understanding. Last but not least were the aesthetics; the display, the props & of course, Keith Lemon’s outfit. I decided to assume the role of Keith, bought a wig & tache, put on my worst shirt, a wrist bandage and my best Leeds accent. I stayed in character the whole lesson. I made a mock-up of the magazine wall used by the show, projected it onto whiteboard & hyperlinked some intro videos from YouTube. These vids were made using “Funny Movie Maker” app & took about a minute to make. 1) Pop the Question: if you’ve ever played “Taboo” you’ll be familiar with the basic idea. Taboo involves trying to describe a key word/phrase on a card, without saying any of the “Taboo” words listed underneath. For example: the key phrase is “Tricuspid Valve”, the taboo words are “right, Atrium, Ventricle and blood”. Each team was given 6 balloons, Inside each, a Taboo challenge. The team member doing the describing had to burst the balloons using the buttocks, then describe the phrase on the card. To ensure fair play, each team had a “moderator” from an opposing team keeping their ears out for any intentional/accidental slips of the tongue. Some groups were great (we had a 5/6 in two minutes! ), some realised their descriptive skills needed more work! 2) The Cereal Box game: this challenge (courtesy of Miss Trotter) was a variation on the oft-played party game, seen in student kitchens across the land. 4-mark exam questions were glued to cardboard boxes of decreasing sizes. The smaller the box, the tougher the question. Three minutes were put on the clock. 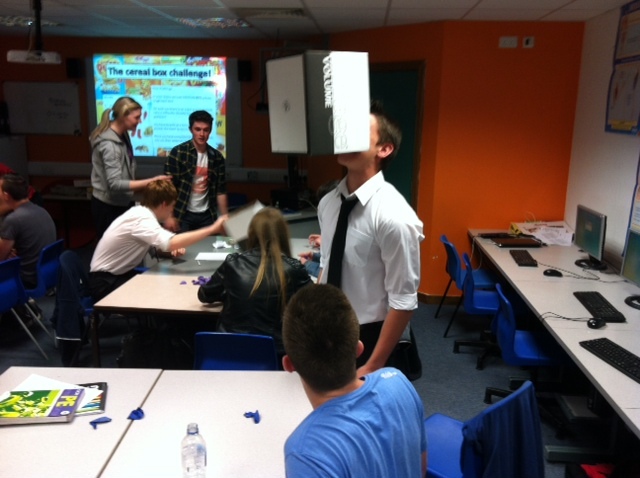 One team member had to pick up a box with their mouth & then attempt to answer the question with the rest of their group. No hands could be used & only feet could make contact with the floor. The longer taken to pick up the box, the shorter the time available to answer the question! After 3 minutes, mark scheme went on the board & answers were marked. And the scores at the end of that round… Shat-ting! 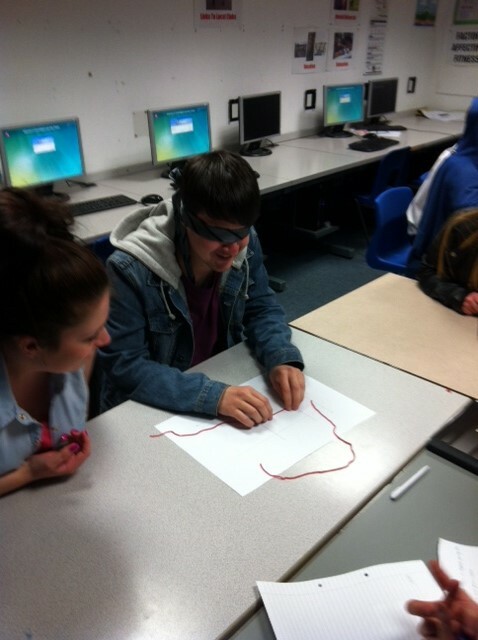 3) Blind graph drawing: I pinched a lot of this activity from another teacher who tweeted the idea a whole back. One member of each group was required to create a heart rate response to exercise graph, using an A3 sheet (with axes) and some strawberry lace sweeties. Numbers/labels also needed to be Written onto the sheet. The twist was that the graph maker was blindfolded & had to rely on their teammates for verbal guidance. Again a moderator from an opposing team ensured fair play. Moderators marked the efforts according to set criteria. 4) Shouting one out: Another of Miss Trotter’s creations based on “Chinese Whispers”. This was a challenge rather than a marked task. Groups were given sentences, definitions & statements of varying complexity (colour coded green-to-red). One person in the group could read the message, then whisper it to the next… You get the game. The addition was that after receiving the final message (and writing it down in whatever form it was now in! ), the last player had to add any additional information they could to the piece of text. 5) Fingers on Buzzers: Pretty straightforward really. A level studies don’t particularly lend themselves to one-word answers so we had to be careful with our questioning. We also got kids to make their own “buzzer” sounds on the iPads. That was interesting. It should that be disturbing? Shouting One Out: More Resp. Fingers on Buzzers: Mixture, with heavy focus on muscles, bones, movements, biomechanics. Let’s be honest, it was fun. I don’t like to pretend things aren’t what they are, so there it is. Fun was the major element. Without wanting to spout meaningless jargon, I recently came across the phrase “academic rigour”. I scrutinised the games & challenges we had presented to the kids and certainly feel like they held up well. The skills we really want from our AS kids were all there, particularly the thinking, communication & descriptive skills, whether verbal or written. This wasn’t simply a “mess around” lesson as I’m sure some sceptical readers will have already decided. I would be happy to wager that the kids learned something. I would also be happy to wager that they enjoyed this format better than sitting going through past papers with me at the front. Easy to do? No. You’ve got to have a screw loose to dress up and talk like Keith Lemon for an hour, but to be honest, that applies to most PE staff I know. This lesson took time to prepare, set up, resource & a lot if energy to deliver. But hey, when the kids are sitting AS paper next week, surely it was worth it. Previous Previous post: Games for Understanding: why and what?